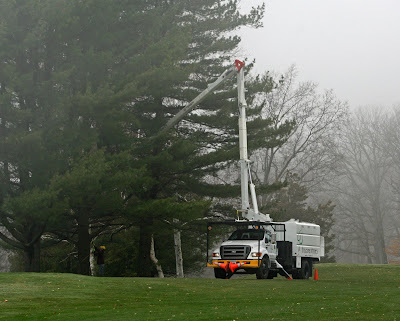 The weather affects everything we do in the golf industry, and the record cold, wet, and gray weather in March and April (until recently) has made for a slow and difficult start. Growing-degree-day accumulations are a solid 14 days behind last season’s accumulations through April 25th. 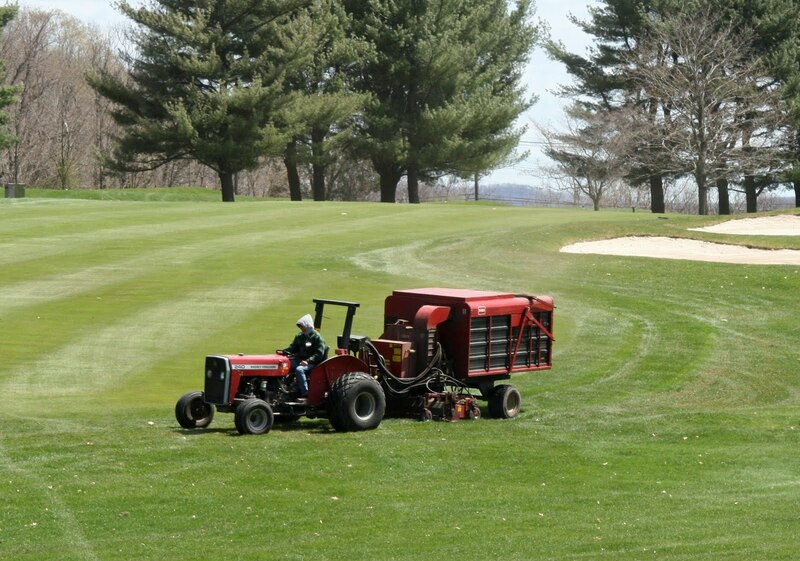 Cold and wet weather periods in a New England spring are not an anomaly, but this season’s weather has been especially hard to stomach for both turf managers and golfers. • Keep the covers handy just in case a hard frost or freeze is anticipated in the next few weeks. • Spike-seed areas where germination has been poor. 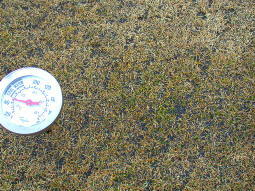 ﻿A call for “rescue sod” may be heard at locations where early seed establishment has been disappointing. Using sod to patch severe cupping or high traffic areas, or where severely damaged greens are kept open to play, is a viable option. The value of a good-quality putting green nursery will be fully appreciated at this point. 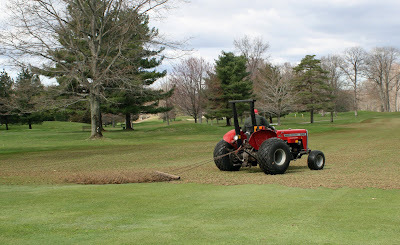 If a sod nursery is not available, then harvest sod from a practice green or other severely injured green. 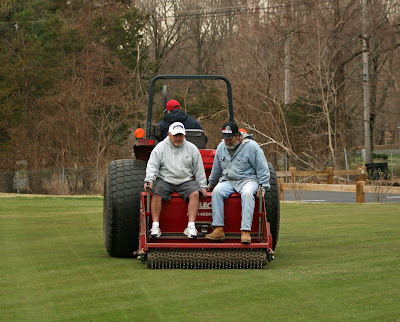 A commercial sod can then be used to re-grass the greens where the sod was harvested. 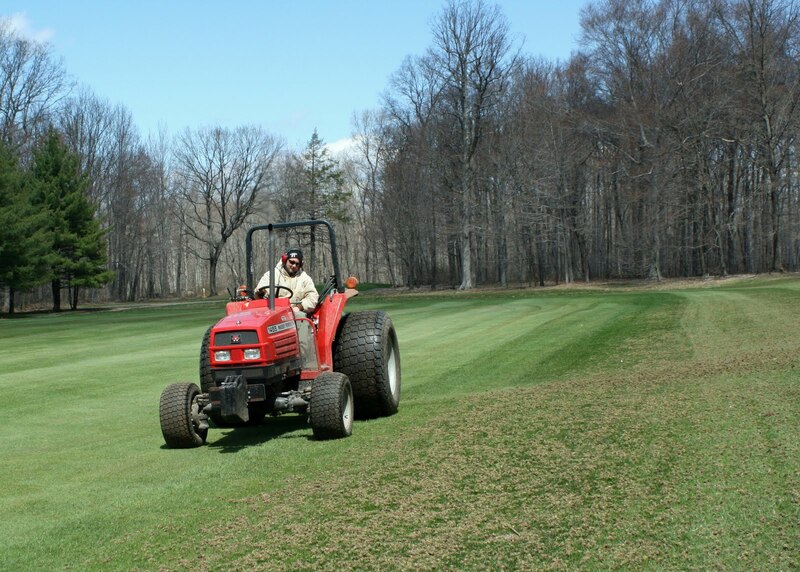 Patching damaged areas directly with commercial bentgrass sod is generally less desirable due to the surface inconsistency that will be created by using a pure bentgrass sod on an older green. Commercial sod blends of annual bluegrass and creeping bentgrass are better suited for the patching work. 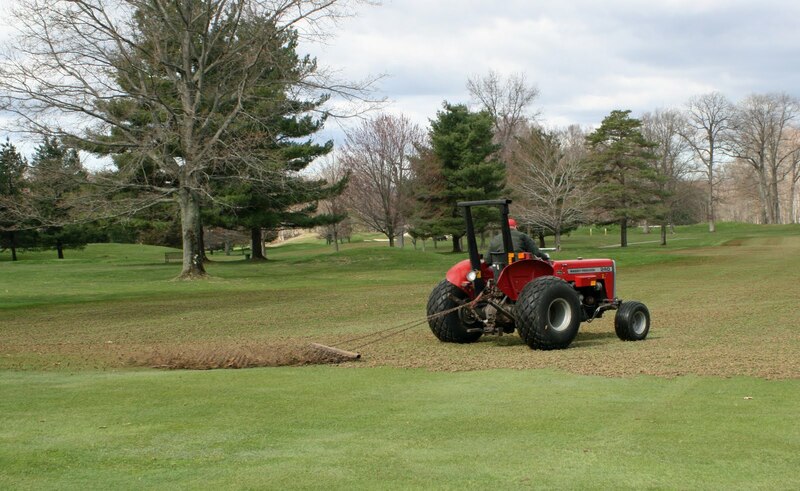 The commercial sod should be soilless (washed) or grown on a root zone similar to your greens. Stay away from overly thatchy sod, which will be more difficult to establish. 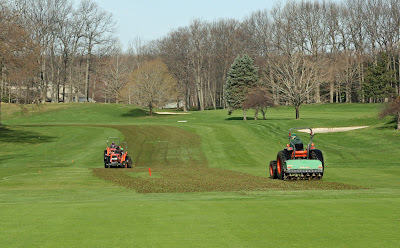 Although tempting, do not be too hasty in abandoning the seeding approach in favor of sod, unless you have a good-quality nursery or other source of sod available on the golf course. The recovery from seed may seem painfully slow, but this method usually produces a more durable and consistent surface by midsummer. Commercial sod will provide faster results initially, but its establishment can be tricky and the effects on the playing surface may be noticeable long past the summer season. 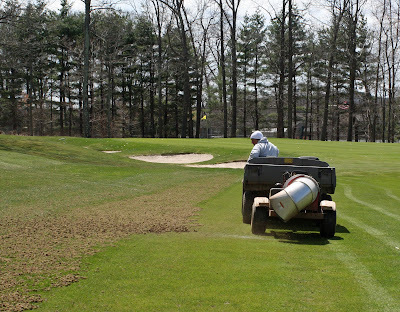 Fairway aerification and cleanup will be completed by the end of today except for some minor touching up. The weather may not have been ideal, but the maintenance staff did a terrific job! That is the end of major aerification until the end of the season. The warmer temperatures expected next week should help the greens and fairways heal nicely and we can focus on improving playability. The intense early season maintenance provides the foundation for the highly manicured turf to survive the stress of summer. Our early season sacrifices will pay off during the peak season of mid-May through September. Fairway aerification began today. Some of the wetter fairways will have to be skipped for now. We will complete the skipped areas as soon as ground conditions improve. 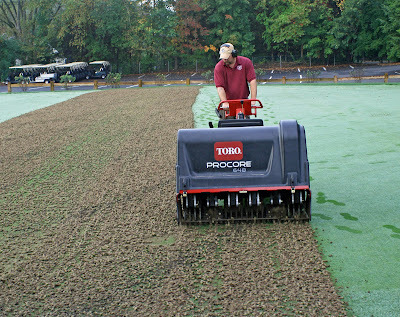 Once the cores are pulled, our staff drags the plugs to remove the soil. Then we use large blowers and a sweeper / vaccumn to clean up the remains. The key to our cleanup is sunny dry weather. Hopefully mother nature will cooperate and we will have the job completed by weeks end. Weather conditions have been less than ideal this week. Clouds, fog and heavy rain have limited our progress on the course. I'm looking forward to the sunshine predicted for Thursday and Friday. 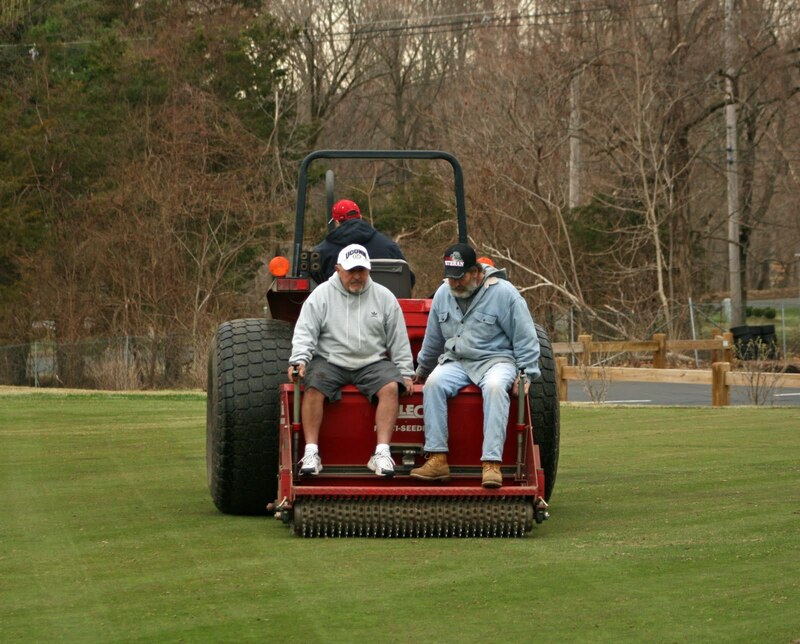 We will be very busy the next two days finishing the aerification process on the greens. Aerification and overseeding is complete. Topdressing is the step that has been most limited by the weather. Topdressing sand needs to be dry for us to properly complete the task. Our goal is to have all the greens completed by late Friday. The tree company has also been slowed due to weather but has made daily progress. 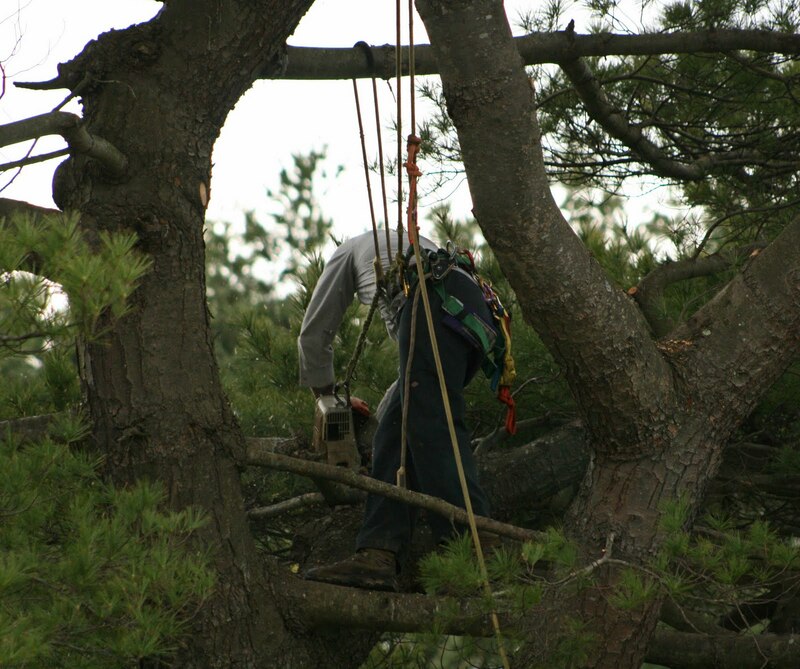 They are using a bucket truck and a climbers to work their way through the pine trees. Wet ground conditions will play a major role in their ability to maneuver heavy equipment around the course in the coming days. We have already had two inches of rain since yesterday. There is significant work to perform in every pine tree and quality is the priority. They have removed the fallen tree at the tennis courts so the fence company can make the repairs as soon as possible. Course supplies continue to be put on the course. 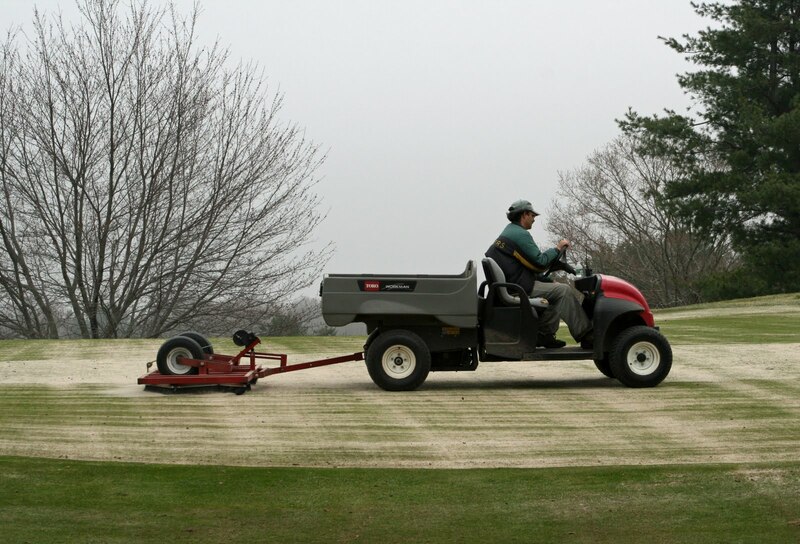 Sand, soil and seed mix will be put on the course as soon as temperatures reach the desired levels to promote proper germination. I look forward to seeing everyone Friday night at the Opening Day Reception! We have started aerifying, overseeding and topdressing the greens. Eight greens have been completed and we will finish the remainder next week. 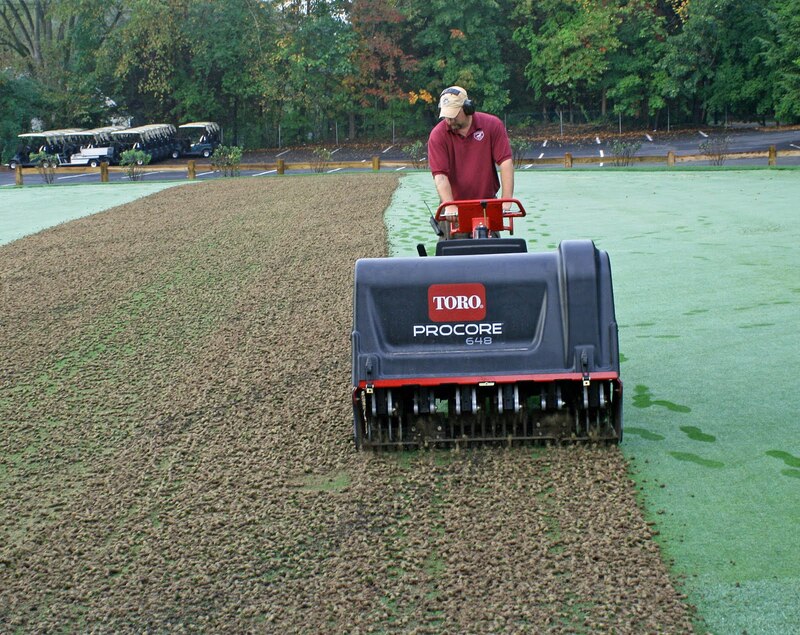 Aerification is one of the most important maintenance practices performed on the greens. Below is a link to an outstanding article written by Senior USGA Agronomist Darin Bevard. Please take the time to read it and keep yourself informed.